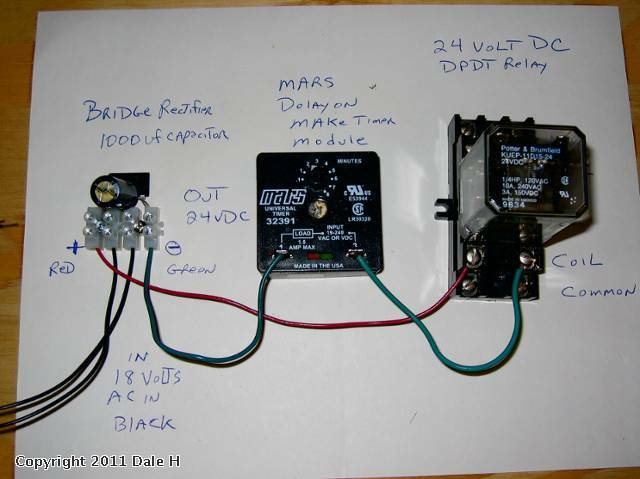 Mars timers are common and inexpensive often used in refrigeration circuits. Other types can also be used but I picked the Mars for availability. When used in conjunction with relays most basic timer functions can be accomplished. Modules can be had for $8 or a bit more. I have a modest supply of them which I sell at my cost as well as relays also $8. They come up on Ebay from time to time Model 32391 is most suitable. You do not hurt my feelings of buying your own. 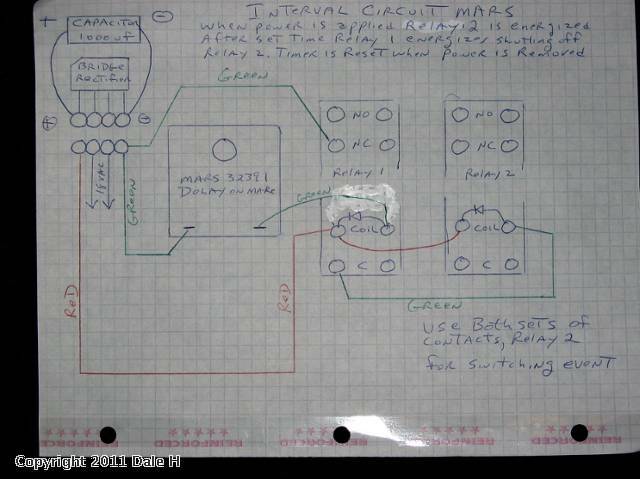 This is a basic timer circuit. The time is set by a pot on the timer from a few seconds to 8 minutes. The timer is delay on make. The 2 terminals act as a switch. When voltage is applied to the black wires to the bridge rectifier, the relay coil energizes after the set time on the timer module. 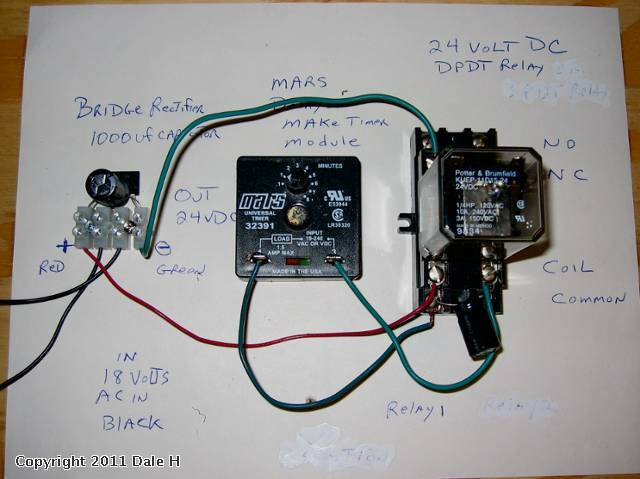 When voltage is removed the the relay de energizes and the timer is reset,ready for the next timing cycle. The relay contacts,2 sets can be used for switching. Used in conjunction with an outside insulated rail block relay this could turn off a track activated accessory,such as a gate man after the time set. If an isolated center rail is used it could be used as a timed station stop cutting power to the isolated rail. The relay coil could be activated through the timer by the outside insulated rail method. Adding a second relay the circuit can be wired as an interval timer. When voltage is applied relay 2 energizes through a set of relay 1 NC contacts but but is de energized after relay one energizes after the set time. When voltage is removed timer is reset. Using the insulated rail method this can be used as a timed stop. If only 1 train is run per loop the center rail need not be isolated as power can be switched off from the transformer. The contacts of relay 2 can do the switching. Also a track activated accessory can be run for a set time then shut off. Using a 2pdt and 3pdt relay a pushbutton circuit can be made. Power is always on the black wires. When the button is pushed relay 2 is energized and latched through a set of its own relay NC contacts (red + wire) A second set of relay 2 NO contacts energizes the timer (green - wire). After the set time relay 1 energizes breaking the latch on relay 2 de energizing its coil. The timer is then reset for the next cycle as the timer circuit is de energized. The third set of contacts on relay 2 does the switching for the event. The following is a repeat cycle timer for accessories activated by momentary pushbutton operation. MTH Sinclair gas station,firehouse,car wash,Mels diner,and lionel PW arrival board are some. The unused NO contacts of the relay are put in parallel with the pushbutton circuit of the accessory. Power is always applied to the black wires (AC in). 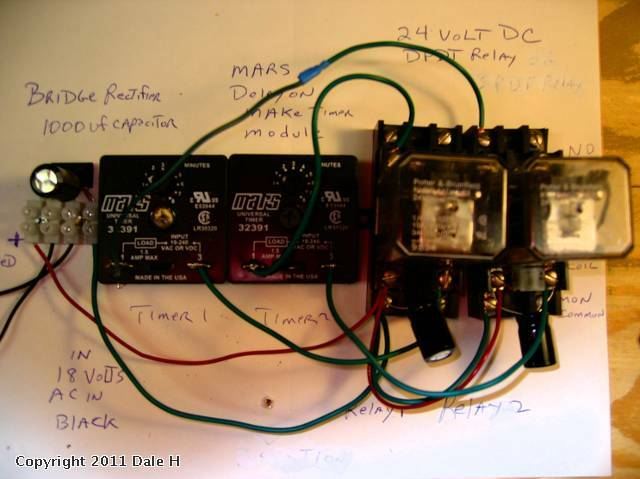 The timer circuit (green wire- ) goes through a set of NC contacts on the relay. After the set time the relay energizes. The timer circuit is then broken and the relay closes,renewing the cycle. A 1000uf 35 volt capacitor across the relay coil (IN PROPER POLARITY) stores energy and hold the relay open momentarily allowing enough time to reset the timer and give sufficient pushbutton duration to start the accessory. So if hooked to one of the accessories mentioned such as the gas station and the timer was set at say 5 minutes it would cycle every 5 minutes just as if you were there pushing the button. 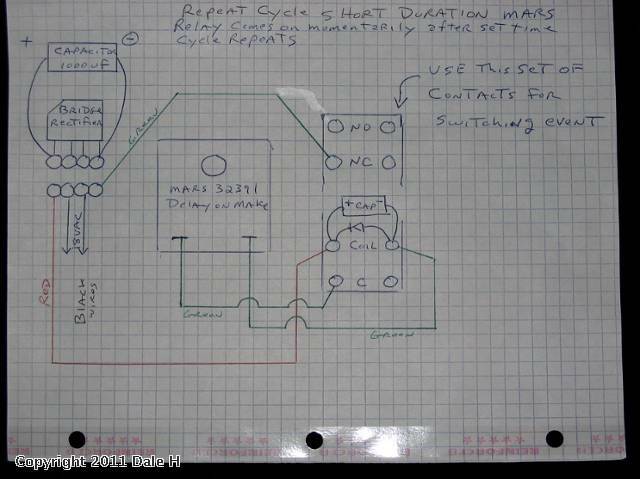 This last circuit is a repeat cycle timer for long duration on and off,up to 8 minutes on and 8 minutes off. This is good for carnival rides,etc It requires 2 relays and 2 timers so it is a bit expensive,(about $32). A set of NO on one and NC relay contacts reset the opposing timers. Harder to describe than wire up. Timer 1 is time on and timer 2 is time off. 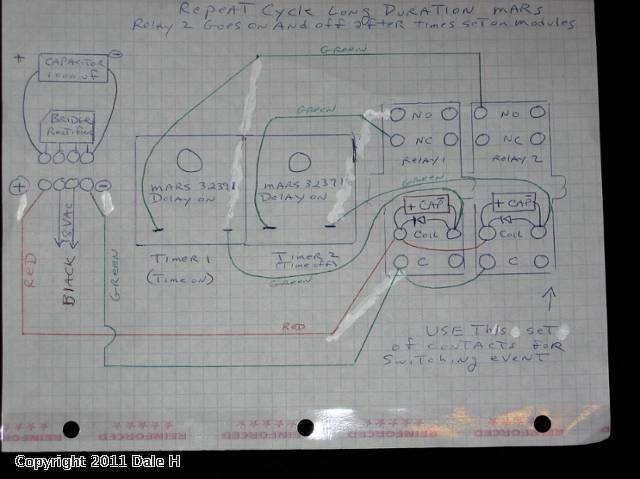 The unused contact set of relay 2 switches the event. Capacitors,1000 uf 35 volt, in proper polarity across each relay coil hold in relay coils allowing timers to reset. Great site with some great ideas. I have a question that hopefully you can clarify. I bought some Mars 32391 timers and I want to use them to turn off an automatic gateman after a short time to prevent overheating the coil. I am having a hard time figuring out how to wire the gateman to the timer. 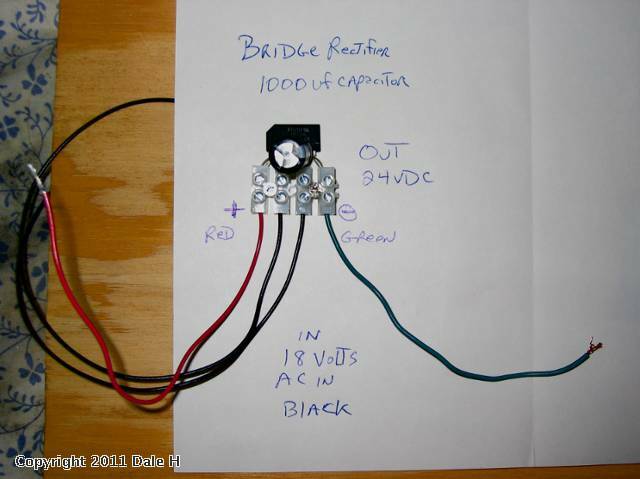 I am using a bridge rectifier to power the gateman. I am also using an insulated rail for activation. I am not understanding how a delay-on-make timer will turn off the gateman after it runs for a period of time. The other problem I am running into is that I want to activate a crossing gate and the gateman from the same insulated rail. However, with the constant light inside the gateman, I am getting a short between the U of the track transformer and the U of the transformer used to power the bridge rectifier, even though the U terminals aren't connected. I was going to use a relay to completely isolate the bridge rectifier for the gateman. Basically, what I want to do is use an insulated rail to activate both a crossing gate and gateman, both being powered by its own bridge rectifier (allowing a different operating voltage for each). I also want to have a timer within the circuit to prevent the coil from overheating should a train get parked there too long. Sorry for such a long email. I have been "fighting" with this for a week now. I'm hoping you can give me some direction with this. 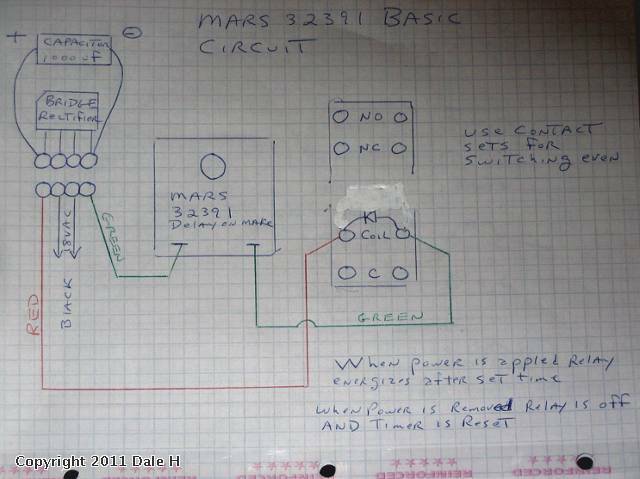 Use the "Basic circuit " described above. 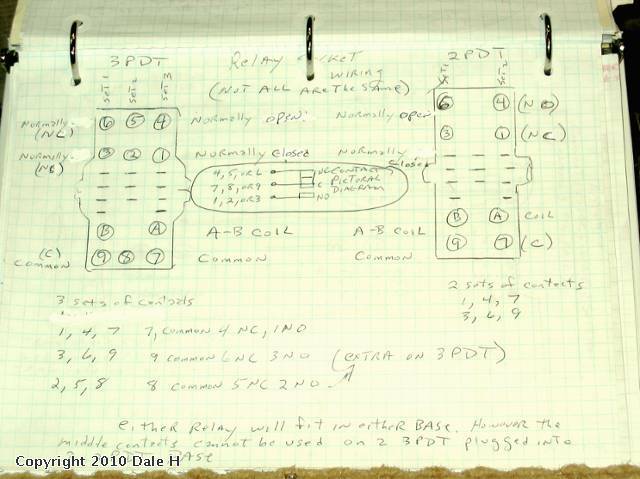 Wire the gate man in series from the block relay NO contacts then through the NC contacts of the timed relay. So when a train is on the insulated rail,the block relay energizes and the timer,also energized through the outside insulted rail,starts its cycle. After the set time,the timing relay energizes breaking the circuit to the gate man. When the train leaves the block the timer is reset and its relay drops out. For the crossing gate,if it is an MTH crossing gate it must have its own set of contacts for activating. This is because the gate is always powered both up and down,an internal limit switch turns off the gate. So for the block relay use a dpdt one. Use one contact set for the gate man circuit and a second set for the MTH crossing gate. 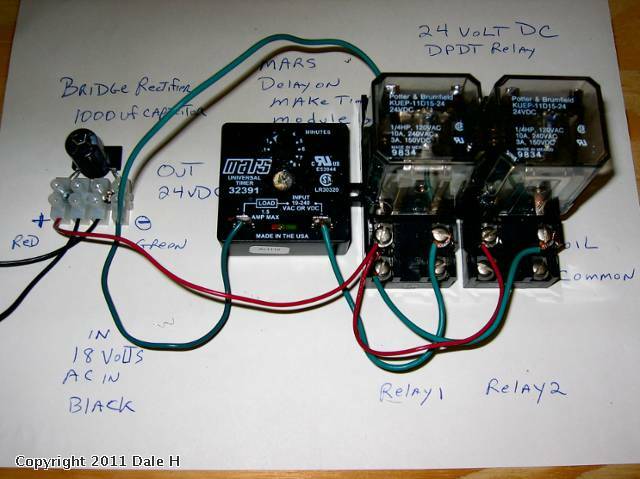 DPDT relays cost $8,see my post on using relays for block detection,the crossing gates are explained there.. The light bulb of the gateman should have a separate circuit,it may share a common but should not be affected by the relay circuit.